Hey guys! Hope you had a wonderful weekend! With the predicted rainfall for the weekend in Orange, I have been spending a lot of time in the kitchen over the weekend, cooking up a storm. For this post, let’s give chicken a break. Today is all about prawns. Australian prawns. Did you know that 40% of Australian prawns eaten at Christmas and on average, each Australian eats 24 prawns per year? In an effort to encourage us to incorporate more prawns consumption into our diet, the Australian prawn farmers and fishers have come together for the first time to launch the ‘Love Australian Prawns’ campaign. As I a big supporter of Australian prawns myself, am excited to join the campaign to spread the love for Australian prawns. I have shared several prawn recipes in the past. I have stir fried them. I have “curried” them. And now, grilled. They are versatile ingredients to cook with and I love the fact that they don’t require much time to cook. I also love that they are low in fat and have zero carbs! 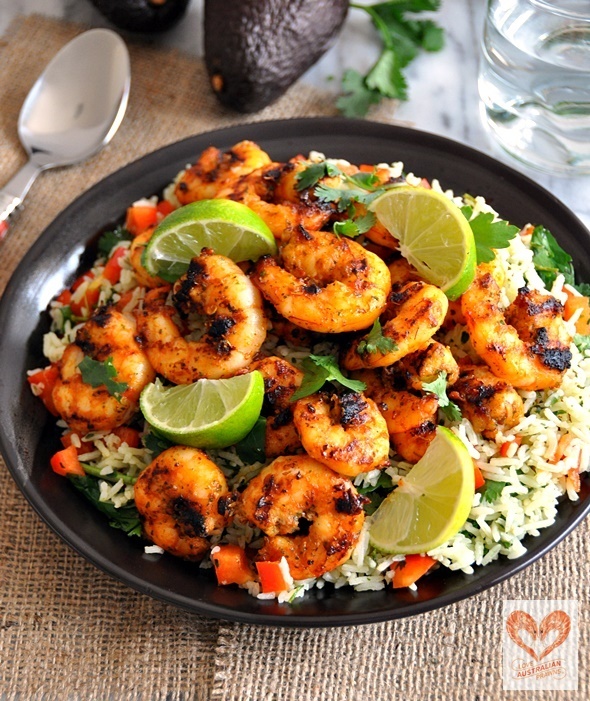 After giving some thought on how I can tempt you with an amazing prawn recipe, keeping in mind that simplicity is the best policy, let’s travel to Mexico with our palate and try this fajita spiced grilled prawns and my cheat version of the Mexican green rice. Marinate: Whisk fajita spice mix with 3 tbsps canola oil in a bowl with a fork until well mix, add prawns to the spice mixture toss to coat the in spices. 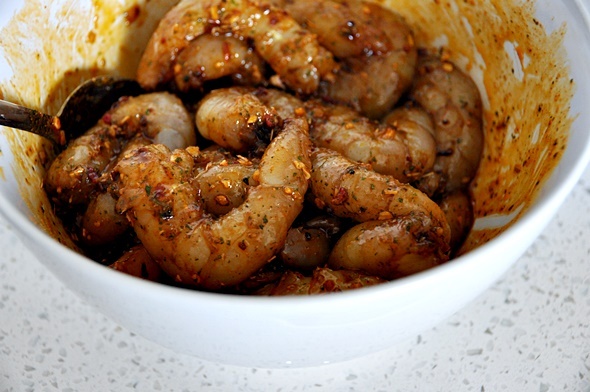 Allow the prawns to marinate for at least 30 minutes in the fridge. 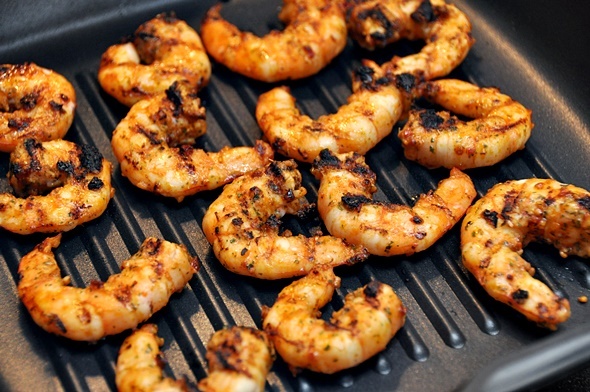 Grilled Prawns:- Grill prawns in a pan or griddle pan in batches. 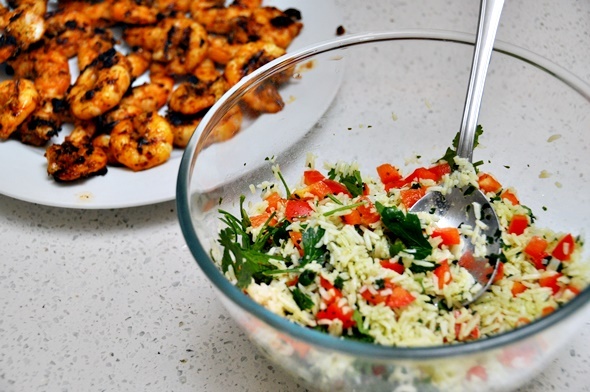 Serve the grilled prawns on a bed of the green rice salad and scatter more coriander and parsley as well as the lime wedges. Squeeze some lime juice before eating. The giveaway is open to 20th November 2013. *Important* Please note that the entry is open to all Australian residents, aged 14 and over and the prize. Prizes are not transferable and cannot be taken as cash. In the meantime, you are looking for more information on Australian prawns or recipes, you can check out the website: http://australianprawns.com.au/. My favourite Prawn time would have to be getting freshly cooked prawns, sitting with the family, peeling & eating them with homemade thousand island dressing as the dunker. Of course on a nice warm summer’s day especially Christmas day!!! Yum, sounds like a great time to me! 🙂 Thank you for your entry. I think I just found tomorrow’s dinner! Hi Emily my favourite prawn memory is going on a family holiday at Port Stephens. On a early morning walk with Mum & Dad we convinced a fisherman to sell us some prawns fresh off the boat. They were the best prawns I’ve had! My favourite prawn memory is eating freshly made pasta with home made tomato sauce cooked with basil and prawns while my dad tried to sing Dean Martin’s “That’s Amore”. My first experience with prawns (many years ago) was catching them – lights, nets and buckets at the ready whilst on holidays with friends. Something I would love to try again!! Combine apricot, butter, mustard and rice vinegar in a bowl. Add curry powder and cayenne. Mix well. Add to prawns and toss evenly to coat. Arrange on aluminium foil lined baking sheet and sprinkle generously with salt and pepper. Grill until prawns opaque and coating bubbles (about 4 mins). 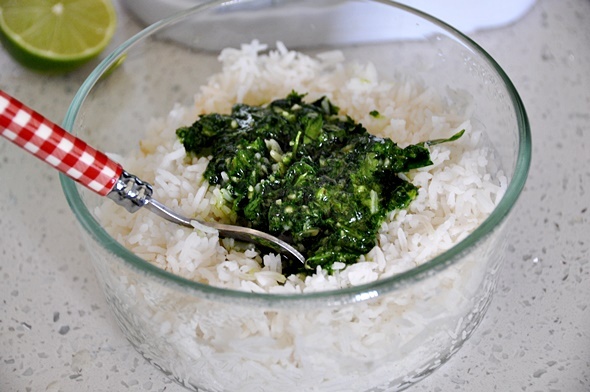 Arrange on serving plate, pour over sauce and garnish with coriander. Have amazing memories with great friends enjoying together our fabulous Australian prawns served in so many delectable ways! a delectable healthy treat, and great for celebrations. it’s so addictive, you’ve been warned!! more if you wish, there’s no real limit! it’s best on high, it can’t be beat. Then take your taste buds for a ride. Will ensure these prawns won’t go to waste. so simple yet tasty, they’re such a delight. When I was young we would meet the trawlers as they came in from the bay. The prawns were so fresh, we would cook them up and serve them with just a squeeze of lemon. Delicious memories! May not my most happiest memory relating to prawns but it definitely is my most memorable. As a child sitting around on a hot Australian Christmas Day with my cousins in the back yard and I was dared to eat a prawns eye and I actually did! I do love prawns but have not been tempted to eat a prawn eye since! My first encounter with a prawn at age 10. I was required to peel the shell. It was both painstaking and unrewarding as the flesh was insufficient. I’ve never forgiven prawns for this injustice. My first year out of college. With limited cooking skills I fried up some Australian garlic prawns with a chorizo sausage and an avocado side salad every single night for an entire year. So tasty I never got sick of it and when I had people over they seriously thought I was some kind of masterchef. Thank you for sharing, this will be our summer dinner tonight! I hope you will like the recipe, Isabelle! And happy summer to you. It’s winter over here in Australia.